This exclusive look into the life of celebrity mother, Andria Mayberry gives the world a glimpse into raising one of Hollywood's hottest up and coming stars. Going back to her days as a young, single mother, Andria takes us on a journey through the dangerous streets of Philadelphia raising Bryshere "Yazz The Greatest" Gray and her daughter, Brianna. What could have easily been just another statistical story turns into a moment of triumph. This single parent discusses raising a child with ADHD, having to escape an abusive relationship and dealing with the ups and downs of raising a fatherless son in a cold world. Today, Bryshere is a star on Fox's number one drama series, Empire. His mother still maintains her full-time job in the medical field, giving the patients the same love and care she has given her children. As a driven parent, she opens up about her dark nights of pain, depression and anxiety. Andria shares how she dealt with giving her daughter the attention she deserved, while focusing on her son's ADHD and career. With insight into the world of being a celebrity mother, this book is sure to encourage others raising a child with a disorder. 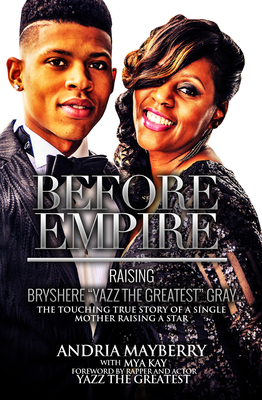 Written with bestselling author Mya Kay of The Clover Chronicles, Before Empire: Raising Bryshere "Yazz The Greatest" Gray is an inspirational true story of a single mother not allowing anything to deter her from pulling the inner star out of her child.